Heat the oven to 350 degrees F. Butter and flour a 9- by 5- by 3-inch loaf pan. Set aside. In a bowl, whisk together the flour, baking soda, salt, baking powder, cinnamon and nutmeg. In a large bowl, beat the sugar, oil, eggs and vanilla until blended. Stir in the bananas and blueberries. Add the dry ingredients and stir just until blended. Pour the batter into the prepared loaf pan. Bake until a cake tester inserted in the center of the loaf comes out clean, about 1 hour. Cool for 15 minutes. Remove the loaf from the pan and cool completely on a wire rack, about 2 hours. This banana bread (or cake, or loaf, whatever you want to call it) is a breeze to make! I followed Giada’s advice and did not even use the electric mixer, was left with only a whisk plus two bowls to clean. Awesome! 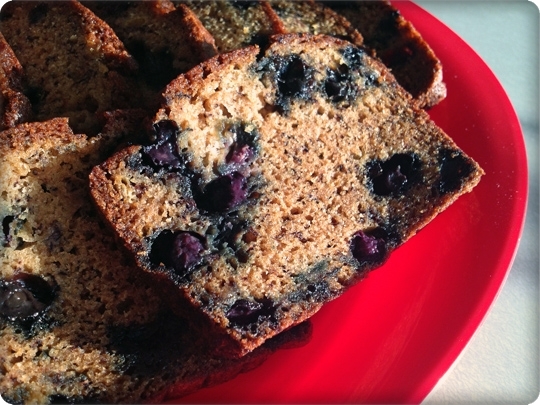 I love banana bread but that’s probably because I never thought of putting blueberries in it! I suppose I could … try it. 🙂 I throw bananas into smoothies and once every few years, I try making banana bread again. Just in case my tastes have changed. It’s mostly a texture thing for me. Perhaps Maureen could use raspberries? Yes, the texture of the banana itself makes me want to gag. Gotta love those early bird perks 😉 — the color on this bread is just gorgeous and blueberries continue to roll in at their prime. Perfect choice. (we have to connect our cable — missing cozying up to tv – especially with the aroma of banana bread surrounding us whilst watching :)). I know what it’s like to move – so many details… can you believe it’s been one year we moved to Kansas and we still have not changed our license plates in the cars? It will come, but we decided to profit from the Oklahoma licensing laws that are a lot cheaper and simpler. That’s one thing that it took me a while to realize, how the different states in the US have completely different laws! You did it! You took a winning recipe and made it better! 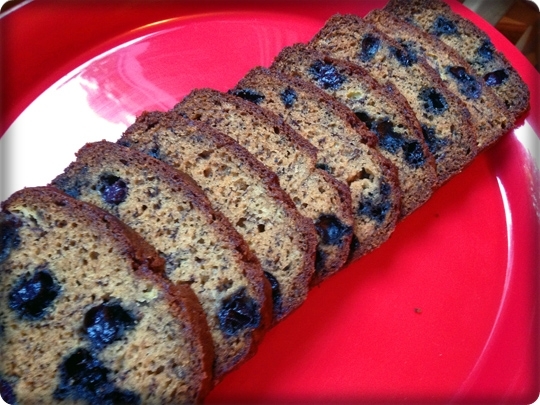 Love the idea of blueberries in banana bread and you description of the combination has my mouth watering. One look at a slice and I was sold. Way to go, Sally! John, don’t tell anyone but a friend of mine sent me a recipe for a banana bread that I will have to try – once I have a kitchen that is.. can you tell I’ve been counting the weeks? I was going to say the same thing John said! 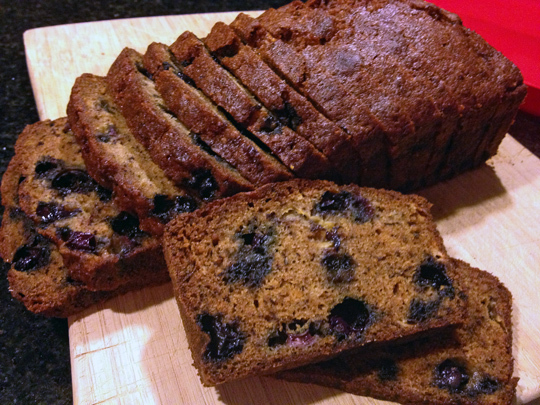 Love the idea of blueberries in banana bread, it’s a wonderful idea and I’ve never thought of adding addition fruits to banana bread and I can tell blueberries would be perfect. Love it. Beautiful banana bread! I loved the addition of blueberries…It gives color and bit of tartness to the bread as well. Thanks for having stopped by and for the birthday wishes, Sally! You are more than welcome! Hope you enjoyed your day! Did I tell you I was finally able to find fresh blueberries in Amman! Sure they are 8 dollars per 125 grams but still they are fresh blueberries! I have some really over ripe bananas so I came here to see what you do with yours. This looks like what I want. I have in my mind that I would like some oats in it, too. Looked at some blueberry/banana/oat recipes on line. None of them trustworthy like you are. But from looking at them and the amount of flour and liquid, I’m thinking I can just add 1/2 cup of oats to this recipe. I’m going to do it this afternoon. This was REALLY good. The 1/2 cup oats worked great. Not having tried it without the oats I can’t say if it made the recipe better or not, but the oats added a little texture and heft. I added them into the dry ingredients and tossed the berries with the dry ingredients before stirring into the wet. You’re right. . . this comes together in a jiffy and mixing by hand is the way to go. Good and moist and even more so today. Simon, our African Gray parrot who hates both bananas and blueberries is out of his mind over it. Wonderful that Simon approved it too! Nothing better than making our best friends happy!